Rio de Janeiro: Empresa de Turismo do Municipio do Rio de Janeiro S. A., printed by Graficos Bloch, S. A., (n. d.). Ca. 1980s. Light wear to edges. Faint vertical crease down left hand edge. An about VG example.. Broadside. 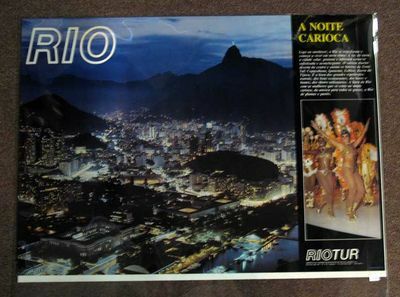 Two color photographic images of a lit-up Rio de Janeiro at night with Sugarloaf Mountain in the background and of showgirls having a blast on a stage in gold outfits. Oblong format: 20-1/2" x 28"